We offer efficient, customer-friendly services to ensure that your event leaves the smallest footprint possible.We offer event services to help make your event as "waste" free as possible. We develop a plan for your event, which includes recycling, compost and trash services, consult on waste diversion plans, monitor and provide bins, educate attendees, and take all the materials away, all for one very low price. On average, we will divert anywhere from 50- 99% of waste. When you retain NRWS for your next event, we provide the bins, manage the recycling throughout your event and haul away the material. We can handle any type of event—concerts, festivals, street fairs, and business events—and any size event, from a few hundred to thousands. We not only show customers and the public that you care about their future and our environment, we can also save you money. We help control discards so you stick to your plan—and your budget. Racks are available for donation; fill out a donation request form and fax back to us. We will contact you about delivery and pick up as well as placement. Customers will have to provide their own bags. These are Clear Stream Racks, they are metal frames with plastic lids. Temp bins are available for Rent. Solid waste bins and carts are charged according to size and location of event. Recycling containers are free with service; contaminated recycling loads will be charged regular trash fees plus a contamination fee. Need help planning your event? Please contact our Recycling and Public Outreach Coordinator to set up an appointment. If you are looking to get services donated please fill out our donation request application. All applications will be reviewed and either denied or approved based on location, need, and set up. Those looking for donations should note that Northern Recycling is a recycling company and it is against our policy to haul material to the landfill that can be recycled. Not sure what's recyclable? Please call us we will work with you to plan your event to make as waste free as possible. PLAN AHEAD - Include recycling from the start of the event planning process. Check with the facility to verify existing trash and recycling services. If these services will not meet your needs, contact your recycling/garbage service provider for assistance in selecting appropriate recycling and trash containers for your event. Advanced notification to vendors and/or caterers is important. A message with instructions about recycling at the event should be included in your written event communications. Think about where the recycling containers will be located and who will be using them (public or staff). There is a variety of equipment available: including carts, bins, and large boxes. 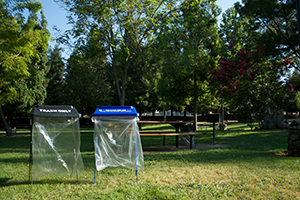 Determine who will be emptying the recycling and trash containers at the event – be sure to communicate with them so you can address any concerns in the planning stages and not on the day of the event. Always place recycling containers alongside trash containers - neither should EVER be alone, since a lone recycling container will just fill up with trash, and visa versa! Lidded containers with restricted openings work best for recycling since this discourages trash. Recycling and trash containers should be different colors (blue for recycling). If bags are used, try to use clear for recycling and black for trash for easy identification. Never use dark bags for recyclables. Proper signage on all containers is Key . It should be clear what items can be recycled - use graphics and provide bilingual information whenever possible. Reminders (signs placed around the venue, live stage announcements, flags, messages in event programs) help reinforce the recycling message. Make sure ample recycling containers are placed near high volume areas: bars, kitchens, food busing areas, food stalls, etc. Work with the cleanup staff – let them know about the program and listen to suggestions. Make sure trash cans are emptied regularly and don’t overflow – this can cause guests and staff to start using the available recycling containers for trash.